The foundation of personal and professional success lies in understanding yourself, understanding others, and realizing the impact of personal behavior on others. For nearly thirty years, more than 30 million people have unlocked the door to productive communication and relationships through the DiSC� Dimensions of Behavior learning approach. � Influence: Optimistic and Outgoing. I's are "people people" who like participating on teams, sharing ideas, and energizing and entertaining others. What are my potential limitations? How do I relate to people and my environment? What are my strategies for creating positive relationships? How can I increase effectiveness in others and myself? How my subordinates perceive me? How do my managers perceive me? How can I improve my communication with those around me? What are my strategies for managing others? How do I direct, delegate, motivate and problem-solve? What is my natural approach to selling? How do I handle objections, gain commitment and manage my subordinates? What type of environment do I prefer? What things do I tend to avoid doing? What's my response to conflict? Which behavioral types are most likely to trigger stress/conflict and how do I most effectively diffuse it? How do I make decisions, manage time, solve problems or handle stress? Any of the following suggested topics could be as short as 90-minutes, covering only the basics, up to a multi-day seminar, covering in detail the area of focus. The multi-day seminar could be as little as 90-minutes/day to several hours/day, delivered daily, at one week intervals, monthly, or even quarterly. Combining two or more areas of focus is also an option, such as "Improving Communication & Reducing Conflict on the Job," etc. This is a highly interactive program with multiple group exercises and self-discovery oriented activities. Participants would also be viewing high quality DVD clips to see each DiSC Behavioral type in action and how each type can adopt to be more effective on the job. * !!! Each module can function as a stand-alone session as well !!! E G Sebastian is an international speaker (speaks six languages) who speaks extensively on behavior, communication, leadership, and personal success related topics. E.G. loves to study what makes people tick - what motivates them, what are their fears, how to recognize and best communicate with different personality types, and how to build successful relationships based on this knowledge. He loves to "Wow!" his audience members with the simplicity of understanding and "reading" different personality styles, and the ease of co-existing with different styles once one understands what makes each personality style tick. E.G. 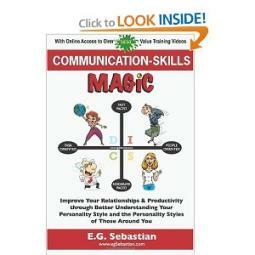 believes that communication and good people skills are the most important skills that one can master. Only with mastery of these skills can one attain true success in both personal and professional life; therefore, most of E.G. 's presentations focus to a great extent on understanding human behavior and building better interpersonal skills based on that understanding. Please click here to read complete bio!